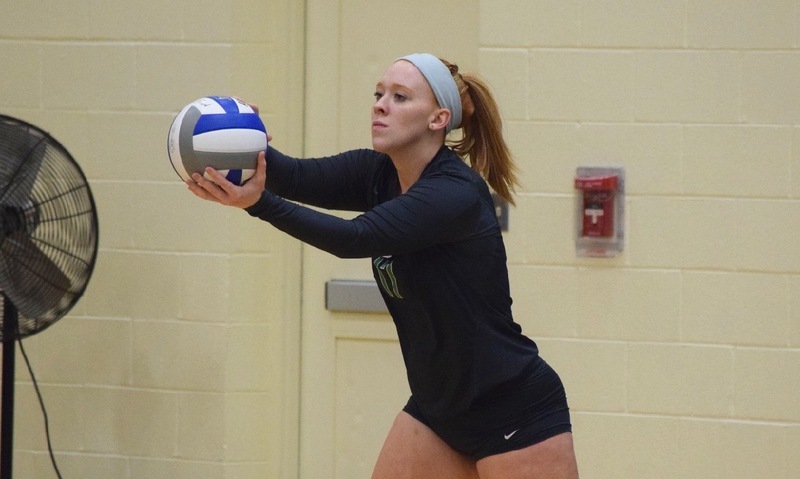 Following a standout career at Canton, which included four league titles, more than 1,000 career assists, and being named 2014 Hockomock MVP and HockomockSports.com Player of the Year, Erin Proctor was not sure that she would try to continue playing at the collegiate level. It wasn’t until May or June of her senior year that Proctor started looking for college programs that would be a good fit, she explained in a phone call this week. She was already interested in Slave Regina University (Newport, R.I.) for its nursing program, so Proctor took a closer look at the volleyball team as well. The Seahawks will be grateful that Proctor changed her mind about playing collegiate volleyball. With another 37 assists on Saturday morning, in a 3-0 victory over the University of New England, Proctor now has 719 for the season, which is the fifth highest single-season total for a setter in program history (the top four all belong to career leader Taylor Violet), and she is now second all-time in career assists and third in assists per game. Her assist numbers would likely be even higher if Proctor had been the primary setter all four years. She took on a more defensive role for the Seahawks last fall and had only 110 assists on the season, after recording 425 as a freshman and 339 as a sophomore. With Proctor back in her usual spot in the thick of the offense, Salve has built a 20-8 regular season record and sits in third place in the Commonwealth Coast Conference (CCC) heading into the league’s postseason tournament. The Seahawks had a blip in the middle of the season where they lost four of five games, but are rolling into the playoffs, having won nine straight and 10-of-11 matches. Proctor is no stranger to success on the volleyball court. She picked up the game in middle school, playing for the Canton Cobra clinics, and she fell in love with the sport. Canton won the league title all four years that Proctor was there and was a perennial contender for a Div. 2 state title. After a year without a championship, Canton earned its 10th league title in 11 seasons just last week. Proctor was asked what makes the Bulldogs such a consistently strong program and she immediately credited head coach Pat Cawley. “I think obviously Pat Cawley does a phenomenal job,” said Proctor, who added that her former coach checks in each preseason and tries to bring the Bulldogs to a Salve match each season. Cawley helped Proctor find the Salve program and helped with her transition to the college game. “She’s just phenomenal and someone I’ve always looked up to as a coach,” Proctor added. Proctor and the Seahawks have found their groove this season and they are hoping to carry that momentum into the CCC tournament with their sights set on bringing home a championship. The last three years have ended in the CCC semifinals at the hands of league power Endicott, but there is confidence around the program that this year could be different, despite a 3-0 loss to the Gulls in the regular season. As a senior, with her college career entering its final stages, all that is on Proctor’s mind is bringing home a trophy. She reflected, “Looking from when I was in sixth grade playing for Cobra club to now…it went by really fast, too fast. Salve Regina will open the CCC tournament with a quarterfinal match on Tuesday.